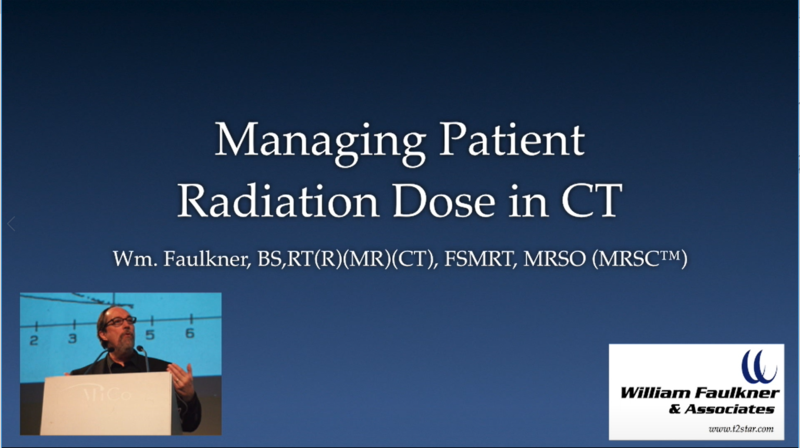 This video is designed to satisfy annual CT radiation dose education for CT technologists. It begins with a brief history of radiography and CT. The factors which affect radiation dose are described along with the biologic effects of radiation. The metrics for measuring exposure and the estimation of radiation dose are explained. Technical considerations for managing radiation dose to the patient are described. Newer metrics for radiation dose estimates in CT, specifically size-specific dose estimates (SSDE) are explained. Finally examples for monitoring and reporting patient dose are presented. The content of this CT Program is intended for healthcare professionals who work in the CT environment. These individuals include CT Technologists, Imaging Nurses, CT Researchers, and Others. The Joint Commission and ACR require annual CT Radiation Dose education (just like with MR level 1 and level 2). This will satisfy that requirement.